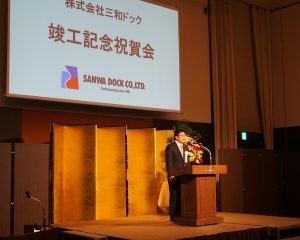 Sanwa Dock held banquets at two separate venues to commemorate the completion of a new dock and head office building: one in Kobe on 11/17 (Venue: ANA Crowne Plaza Kobe) and the other in Tokyo on 11/28 (Venue: Dai-ichi Hotel Tokyo). 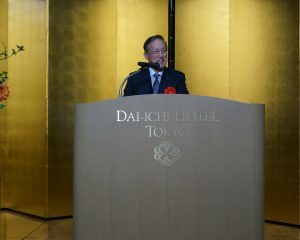 These banquets were held to celebrate the completion of the No. 7 Dock (L 220m x B 45m) in May 2016, the new Head Office Building (no. of floors: 5 above ground/1 underground; total floor space: approx. 3,225m2) in July 2016, and the East Factory (Pipe Shop, Warehouse, and No. 3 Finishing Shop; total floor space: approx. 4,479m2) in March 2017. At the same time, Sanwa Dock wished to thank and apologize to its clients for the various inconveniences caused by the construction work. 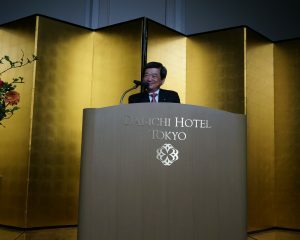 The guests of honor at the Kobe banquet were Koichi Fujiwara (Chairman and President, ClassNK) and Minoru Yoshida (Director-General, Kobe District Transport Bureau, Ministry of Land, Infrastructure, Transport and Tourism). 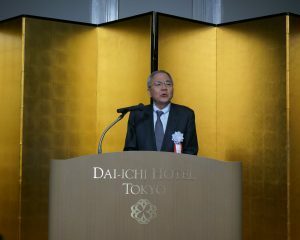 In Tokyo, Eizo Kobayashi (Chairman, Itochu) and Koichi Fujiwara (Chairman and President, ClassNK) were the honored guests. A total of about 400 guests attended the banquets. 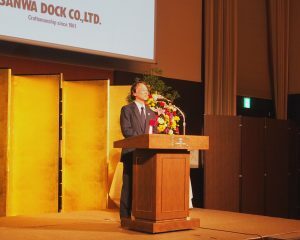 While making the most of its new facilities (including the new dock and head office building), Sanwa Dock will maintain its customer-first philosophy of stable management in order to contribute to Japanese shippers’ “safe voyages at sea”.